I love quinoa salads. Quinoa is a high protein seed, more closely related to the spinach and beet root family then other grains. It contains contain essential amino acids like lysine and good quantities of calcium, phosphorus, and iron. It is also delicious, light and easy to accessorize. Method 1. Rinse quinoa in a fine strainer until water runs clear. Place in medium saucepan with 2 cups of water. Bring to a boil and then reduce to a simmer until almost all of the water has been absorbed. Remove from heat. 2. Break feta into 1cm*1cm pieces. Zest the lemon over it and add olive oil, vinegar, juice from 1/2 the lemon, parsley, garlic, salt and pepper. Allow to marinate. 3. Steam podded broad beans for about two minutes - until the beans are just tender. Transfer to a bowl of iced water. Pop the beans from their inner pods. 4. 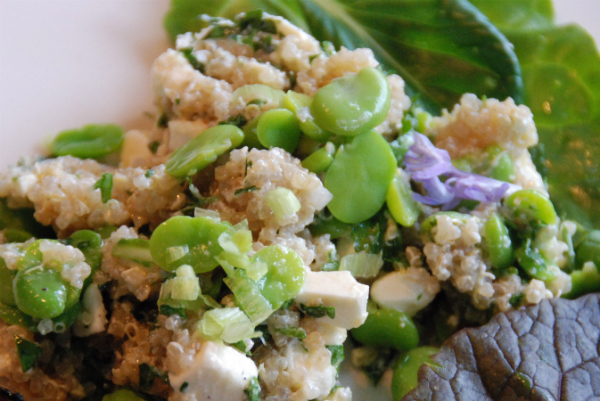 Add the cooled quinoa to the feta and broad beans. Adjust seasonings to taste. Add extra olive oil if necessary.